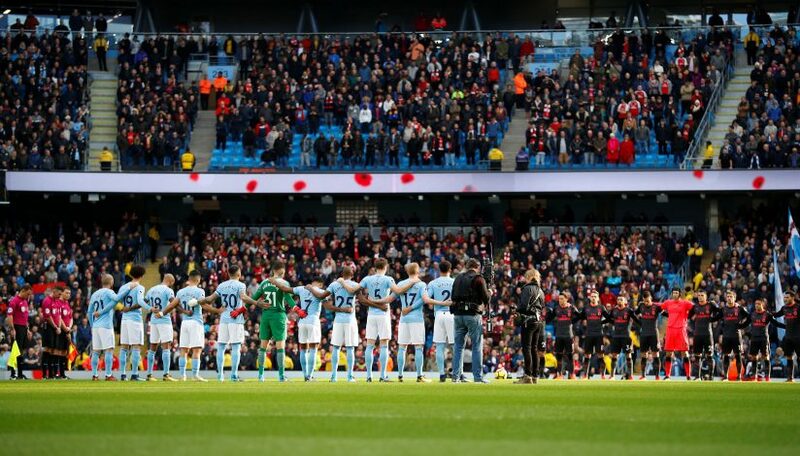 The first London vs Manchester fixture of Super Sunday kicked off between Arsenal and Man City at the Etihad Stadium, which ended in the favour of the hosts. Right from kick-off, the Sky Blues looked to be in complete control of the match, with the Gunners momentarily snatching it back at certain points. Nevertheless, Arsenal’s constant efforts failed to pay off in the end, as City managed to extend their unbeaten run to 23 games across all competition in a 3-1 thriller. Goals from Kevin De Bruyne, Sergio Aguero, and Gabriel Jesus saw their side ease past the Londoners, who could only respond through their only goal from Alexandre Lacazette. Well, hasn’t this been the most frequently asked question in most of Arsenal’s defeats? The Gunners faithful plunged into panic right after the starting lineup was announced. Whilst Sead Kolasinac returned to the squad after a minor knock, an odd but familiar pair of Laurent Koscielny and Nacho Monreal took central roles in the back four. But what angered most fans was Arsene Wenger’s selection of Francis Coquelin as the midfield partner for Granit Xhaka, whilst Alex Iwobi got the nod ahead of Alex Lacazette. Consequently, the fears of the Gooners came true on the pitch, as Iwobi constant failed to offer anything to the team’s progression, all the while Xhaka and Coquelin could not sync together a partnership. The issue was further reinforced by the former Lyon man’s impact on the match after coming off the bench and scoring. The introduction of Jack Wilshere also looked promising, but only managed to show selecting him over Coquelin could’ve proven to be more fruitful. Contrasting points put together for a reason. Pep set out his team with a set purpose of exploiting Arsenal’s shaky defense. Leroy Sane and De Bruyne constantly posed as a threat, and never failed to leave any stones unturned, which eventually paid off with the Belgian scoring the opening goal. On the other hand, the back four of Kyle Walker, Nicolas Otamendi, John Stones and Fabian Delph seem to share an almost perfect understanding with each other, alongside Ederson, who rarely makes mistakes. The fusion of these two aspects, along with the lethality offered by Aguero proves to a winning formula for Guardiola’s side, which has sparked whispers of invincibility. Though it would be criminal to say the North Londoners performed bad, the Cityzens were just much more decisive and clinical on the pitch. 3. Return of the November Curse? Arsenal’s seeming bad run of form during the month of November has been named the ‘November Curse’ by the supporters, and it seems as if it has back to haunt them. The Gunners were controlled by Guardiola’s side, and have tasted their fourth defeat of the campaign. Along with receiving the short end of the stick in their first match of November, they were also humiliated by a third goal, which turned out to be offside. Though hardly anything can be done about City’s highflying Belgian’s goal, the Gunners ended up conceding a penalty which was sweetly finished off by their new all-time top scorer. What made the defeat worse came through Jesus’ offside goal which was assisted by David Silva. On the other hand, Alexis Sanchez’s performance also indicates his wish for an Emirates exit. 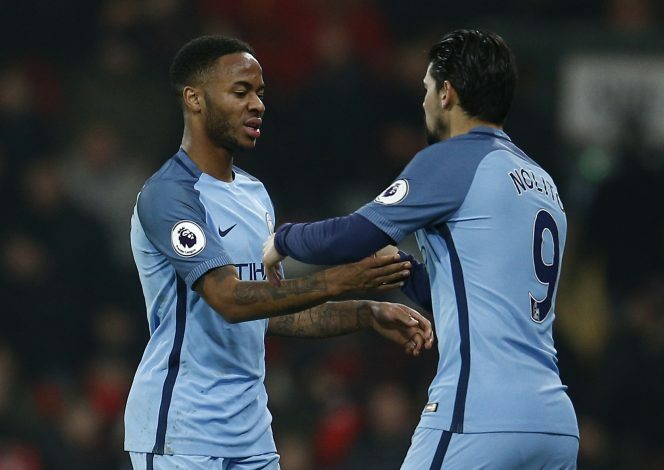 Though his side was the better team in almost all aspects, Guardiola will be dissatisfied with Raheem Sterling. The Englishman first failed to capitalise on a low cross from Sane, which would’ve been an easy tap in, and later on, he couldn’t produce yet another easy pass to the German, denying him a simple tap-in. Though the result does make up for his mistakes, the City boss will certainly be asking some questions in the dressing room. It’s no secret that the Emirates outfit are clear of their glory days, and their recent form has proved so. Arsenal have constantly tasted defeat at the hands of England’s top six clubs, and today’s loss only adds salt to the would. Out of the possible 45 points, the Gunners have only secured 7 points in the league away from home against these sides; something Wenger should probably take care of. Nevertheless, the Mancunian giants are now the clear favourites to win the Premier League title, and comfortably sit 8 points clear of second placed Man United. The race for the top four is also heating up, and gives fans a look into what awaits them towards the end of the season.